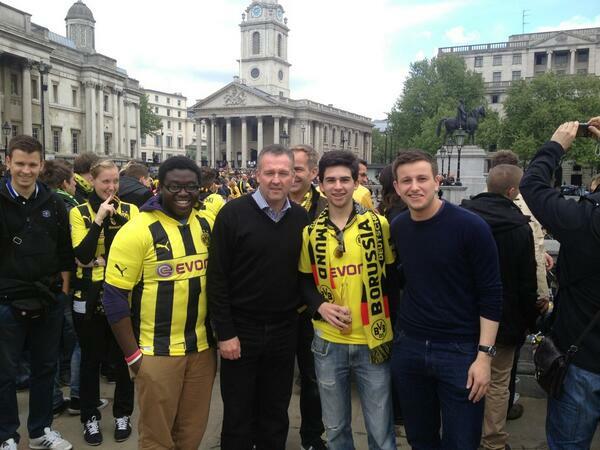 A Champions League winner as a player with Borussia Dortmund, Aston Villa manager Paul Lambert appeared relaxed before the media last week, happy to talk about his experiences with his former team, as they came to London for the final of this year’s Champion’s League at Wembley stadium. Lambert enthused to Guardian journalist David Hytner that he had joined Dortmund with a mix of self-doubt, introspection and genuine excitement to be amongst so many Euro 1996 winners such as Tottenham’s live wire assistant coach, Steffen Freund. The Villa manager would have experienced similar trepidation to those youngsters who made the jump from lower league football to the Villa Park last season. Stepping up to a new level is a daunting yet exhilarating moment in a player’s career, as could be shown by the elation on the faces of Ashley Westwood and Christian Benteke on deadline day last summer. With the spotlight of success shining on Dortmund once again, Paul Lambert will be seeking to find his own winning midfield formula. One of the criticisms of Martin O’Neill was that he often played players out of position. Alex McLeish was also known to shuffle his pack of cards and emerge with surprising results. McLeish once memorably explained, “We now know what Emile can do. He can play in any position. I could even play him at the back without any fears…..” Villa fans were suspiciously unpersuaded by the thought of Emile Heskey as a Libero centre back likened to Franz Beckenbauer. Heskey was, in actual fact, utilised generally by McLeish in the trequartista position which resulted in more raised eyebrows from Villa fans. Paul Lambert himself will have studied the composition of various central midfield partnerships during the season. Some materials have bonded together, whilst other compounds have fizzled out with disappointing results. Many fans will remember the insipid team display in the 1-1 home draw against Norwich, where Norwich controlled the midfield, in contrast to Villa’s impressive late season 6-1 drubbing of Sunderland at home. Lambert’s former side Dortmund lined up against Real Madrid in a 4-2-3-1 formation in the Champions League this season. The central midfield consisted of Sven Bender (defensive midfield), Gundogan (deep-lying play maker) and Mario Gotze (creative midfield). Out wide were two hard working and rapid wing forwards Kuba (Poland’s Captain) and the intelligent Marco Reus. Paul Lambert has employed the 4-2-3-1 formation on various occasions this season, firstly with two deep-lying playmakers in Westwood and Bannan, which lacked physical presence but excelled at times with possession football. Another partnership in the 4-2-3-1 formation was Westwood and Delph (a box-to-box midfielder), with N’Zogbia in the free attacking central midfield role. Again, this combination were sometimes outnumbered and out-muscled with N’Zogbia failing in his duty to pick up the deep-lying opposition midfielder; most notably Rooney in the first half at Old Trafford which resulted in N’Zogbia being subbed. Most recently, Sylla has joined Westwood and Delph in a more secure central midfield with three orthodox central midfielders. Sylla (whether to free him of responsibility on arrival or not) initially played in front of Delph and Westwood and defended from the front, such as the match against Liverpool. Sylla has recently dropped further back on the pitch, allowing Ashley Westwood to roam further forward on the pitch and notch up four assists against Sunderland and Norwich in back to back games. The defensive block, helped by the changes to central midfield, seem a little more secure. Although goals are still conceded in transition and somewhat frustratingly from set pieces. In the year of 2002, Villa had two powerful players in the form of Ian Taylor and George Boateng, by 2003 both players had left the club and a procession of failed defensive midfielders have since shuffled through Villa Park, including Gavin McCann, Steve Sidwell and Nigel Reo-Coker. There is hope at this early stage to suggest Sylla may develop into a useful defensive player. Can Sylla be the new Sven Bender? Villa fans would be hoping for a surprise or two next season from the young French midfielder, who is similar in stature to Lass Diarra. In addition, as the only defensive midfielder in the Villa squad, Lambert may be scouring the market for a player to add competition in Sylla’s position. Klopp’s Dortmund also have a quality deep-lying play maker called Ilkay Gundogan who has been linked with Barcelona and Madrid to eventually replace Xavi or Alonso respectively. His progression since joining Dortmund from FC Nuremberg has been a delight for exuberant manager Jurgen Klopp, who appears to have unearthed a star and an increasingly valuable asset in Gundogen. Gundogan is of similar age to Ashley Westwood, 22-years-old, and possesses many of the same skills. Technically strong, mature, excellent passing range with an impressive speed of thought. If you want to look for speed of thought in Ashley Westwood’s play, look no further than his delicate cushion of the ball against Norwich, a quick spin to face the opposition goal, followed by a lightening, perfectly weighted pass for Gabby to slot home. The missing element from Aston Villa’s midfield, however, is a player similar to Dortmund’s brilliant, Mario Gotze (a Bayern player next season). Lambert employed a creative midfield schemer in the 5ft 6 frame of Wes Hoolahan when he was at Norwich with great success. Lambert utilised Hoolahan behind the strikers in a midfield diamond and the player impressively scored 13 times in the 2009 / 2010 season. Villa have long since failed to find a player who scores regularly from central midfield and a trequartista who would create and score goals would vastly improve the Villa central midfield in my opinion. When he arrived at Aston Villa, Paul Lambert challenged Stephen Ireland and Charles N’Zogbia to deliver for the team following their previously disappointing seasons. Lambert conceded that they had “lost their way“. Both players have failed to take on their manager’s challenge and they remain ‘lost‘ to varying extents. The creative midfield role has often been vacated this season altogether on the pitch or occasionally occupied in fits and starts by Weimann (without success) N’Zogbia (with inconsistency), Holman (hard work but reduced creativity), or Ireland (without much work rate or end product). Daily Mirror journalist James Nursey intimated that Villa will look to offload Bannan and Ireland (backed by rumours coming from the end of year Villa awards dinner), if suitable offers arrive this summer. Leeds may be interested in Bannan, whilst Ireland may look stateside for a new challenge (he seems to have got a new agent stateside too). In addition, Charles N’Zogbia has been linked with a move to money bags Monaco and Chris Herd has been earmarked to cover Matt Lowton next season, after the club released Eric Lichaj. This suggests that Herd won’t be counted as a central midfielder, and certainly not one who can play the creative role. It is a shame that Bannan was never given the opportunity to play beyond a defensive midfielder and playmaker, as his skill set is perfectly suited to the skills Lambert employed in Hoolahan. Bannan has spent much of the season in a double pivot with Westwood, and faced a difficult challenge as a slight, young partnership outnumbered by more physically strong three man midfields. However, with old faces looking to pastures new and Bannan, Ireland and N’Zogbia possibly no longer in the manager’s plans, Lambert will have the summer to find his own Super Mario. Fantastic article and a beautiful read. Totally agree that we need that biting edge attacking midfielder, that has been missing for years. Ireland is just a waste man and N Zogbia feels he doesn’t have to pass the ball to anyone. I see we have been link with Bellhanda, who seems to be interested in joining us. But what about Adel Taarabt? He had a bizarre season with a bizarre team! But he is still young, wants to prove his worth and would surely want another shot in a team, where he could consistently play with young and hungry players. The only thing that could hold him back is his ego! What about a loan move for Thorgan Hazard (Young brother of Eden Hazard)? Attacking midfielder, who is young, apparently on a par with his brother and would love the chance to link up with Benteker’s for a World Cup place. Another Chelsea lad, who had a stormer with Werder Bremen, was Kevin De Bruyen. Both are in the Belgium national team squad and would be hungry to play an attacking role in an openly attacking team. There are young, hungry options out there. My mouth is watering for next season. im one of those sad cases who write down our possible team combinations, only for me to hit myself (again) with a short stick and remember the golden rules of … ‘football being an easy game complicated by fools’ …. and … ‘a team is structured from the back’ … and i think the addition of a CB Lescott (a villa fan) and Cresswell will do a lot for our team. On the point of Bannan i was a fan of his (and still am in a way) but unfortunately like so many before, he cant handle money … too many times seen on the piss, and thinking he’s done it now he’s in the A team. But in all honesty (personally) i saw something in him of a mentality likened to Merson (if i may be so bold) …. he saw things that a lot of players didnt … ‘the through ball’ … ‘keeping the opposition guessing’ …. Was he good at it? … No, not all the time … BUT he had that mentality! Q: Is he worth a chance of playing behind the forwards? I would love to prove myself wrong! He obviously needs a reality check with his social life, but i think he might excel there …. And please dont start by saying he’s small …. many a great player has been, and is small … Just a though! joe bloggs I too am not a Bannan hater and would be sad to see him go without fulfilling his potential. Too often this season he was up against two bigger but less talented midfielders and was overwhelmed. But to dismiss him is to miss the point. He is in direct competition with Delph for that spot next to Westwood now that Sylla has added some bite to the centre. Bannan and Delph both have their weaknesses – but they also have their strengths. If I was Bannan I| would be staying off the beach and out of the bars and I would be training like a boxer for a world championship fight – building strength – improving stamina – honing technique and skill. If Bannan stays it will be his last chance – he can be great – and I hope he is great – but it is up to him. Tired of seeing talent pissed away – Lee Hendrie anyone? Yes, agree with this – we have not had a quality creative midfielder since…well, Merson, really and he wasn’t a traditional AM. We’re not going to get a Gotze or even Gotze-lite player because they are few and far between, expensive, and wanting CL football. But there are some creative midfielders who are a little older and may be up for a move to Villa. The one I had my eye on was Josip Ilicic at Palermo – he almost saved them from relegation, but not quite. He’s tall, strong, works hard, and is attack-minded with a peach of a left foot. Not sure if he’d be out of our price range, seeing as how Palermo always demand top prices. De Brunye from Chelsea would also be a smart move, but I’d guess he’d go to the Bundesliga given how well he did there last season. If nobody goes in for Sebastien Rode this summer, we should make a late move – very good all round midfielder. The big boys are sniffing round him, so doubtful we’ll get him. Craig – the point is not to try to buy the Mario Gotze of now – for he would indeed be expensive as they are few are far between. The point is to buy the Mario Gotze pre-Dortmund – just as Dortmund did. Spotting young dedicated talent and developing it. Dortmund are not the only ones doing this – Porto have been doing this for years – and selling every year – yet still finding more talent. It is a mindset thing. Either you are a believer in innate natural talent and that talent being scarce – or you are a believer in talent being just a skill – a skill that can be improved through training and practice. Research shows that athletes who are told they are ‘naturally gifted’ may not do as well as those who are told they have to work but can become whatever they want. Villa are on the road of spotting young talent early – and developing it – not buying it ready made off the shelf – and I for one cannot wait to see what comes next. SonLyme CraigWright Spot on. It’s definitely the Lambert mindset – to be ahead of the curve in bringing players with real potential. All players start somewhere. If we can find a midfielder to have a similar impact to Benteke and sort out the defence, we won’t be far away from being a decent team.